Orbis Terrarum Tabula Recens Emendata et in Lucem Edita per N. Visscher - Visscher, N.
Title : Orbis Terrarum Tabula Recens Emendata et in Lucem Edita per N. Visscher. Size : 12.2 x 18.7 inches. / 31.0 x 47.5 cm. 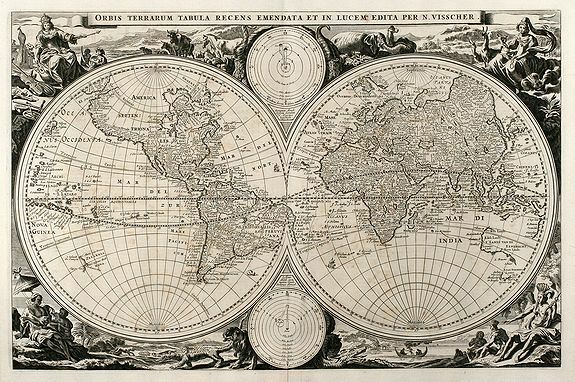 Description :Attractive worldmap in double hemisphere with two inset astronomical diagrams. From a dutch bible. Surround with allegorical representation of the continents. Visschers second worldmap. Condition : Minor age spotting. Small hole in title and lower centerfold backed. Very good condition.